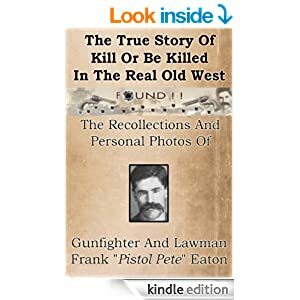 Old West Lawman’s Forgotten Memoir Found: Reveals The True (At Times Disturbing) Story of Kill Or Be Killed Shootouts In The Real Wild West. Recently discovered memoir by one of the Old West’s most feared (yet, virtually unknown today) gunfighters, hired gun regulator and lawman puts you behind a pair of Colt .45 six-guns and immerses you in the real life man-on-man fast draw shootouts, hell-bent-for-leather outlaw chases and lead dodgin’ narrow escapes in the Real Old West. rare eyewitness account of what it was like to live and die in the Real Old West is a must read.